Family entertainment and leisure complexes ‘Meeting zone’ and ‘Magic Planet. Add the wonderful climate and a large number of sights to everything listed above, and you will understand that there cannot be any doubt in where to go on holiday. 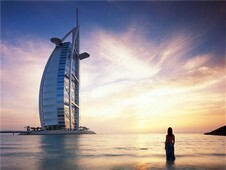 However, in order to enjoy rest to the full, it is worth seeing to car rental in Dubai. This should undoubtedly be done if you wish to have a free hand. Those who come to Dubai on business will not also do without a car since a car allows getting a full freedom of movement. It is possible to rent a car at the Dubai airport right upon arrival. It is also opportune to do it in advance, before the start of the trip. For example, the service bookingcar.ru can be used for this purpose. When going to Dubai and planning to rent a car, it will not hurt to get acquainted with relevant information concerning the driving regulations in UAE, parking lots, petrol stations and others by no means unimportant nuances. Heaven forbid you to drive into collision with a camel. Yes, don’t laugh. You have got it right. This administrative offence is extremely serious in UAE. A person guilty of this offence is due for a hefty fine calculated in thousands of dollars! In Dubai, the authorities are also very serious about following the speed limit. Practically all roads are equipped with numerous surveillance cameras and speed guns. Renting a car in Dubai, please, remember that if you scorch, you will have to pay an extremely large fine before leaving the country. The speed limitation within the city is between 40 and 80 kilometers per hour. It depends on a concrete district. That is why, you are advised to be careful and pay attention to highway markings all the time. On speed highways, the vehicle speed is limited by 120 kilometers per hour. By the way, speed guns and surveillance cameras work perfectly on speed highways as well! There is no lack of parking spaces in Dubai. At that all car parks are paid. However, it is interesting that parking spaces are paid at any time of the day, except for the time between 13.00 and 16.00. In order to pay for a parking, it is necessary to push the button located on the automatic barrier. If you are lucky and there is a free place on this parking lot, the barrier will put up and give you a payment receipt. It is extremely undesirable to lose this receipt since the time of your coming to the car park is pointed out in it. This is why you will need this receipt later when you pay for the parking. Providing you have parked your car for less than 30 minutes, you will pay nothing. In case you have parked a car for more than a half an hour, the cost of parking will be rounded to one hour. Arabian authorities are also intolerant to drunk drivers. UAE pertains to a small group of countries, which do not allow any alcohol in human blood at all. Therefore, if a driver’s blood alcohol level appears to be more than 0 permille, he or she is guaranteed to have serious problems with the law. At that this regulation concerns foreign citizens as well. Except for paying a large fine, they risk being prohibited to enter the country for the whole life. In Dubai, it is customary to rotate when crossing the intersection. At that the drivers who are on the traffic circle at a particular moment have an advantage. It is regarded as a fragrant violation to cross into the intersection, which is already occupied by other vehicles, even if the permissive traffic-actuated signal is turned on. This is of course an unwritten rule, but all road users in Dubai without any exception obey it. It is accepted to warn the car driving behind you about the presence or absence of an obstruction for overtaking on the road with a turn signal. By no means can you transport alcohol in the passenger compartment of a rental car in Dubai. Only the resident of the country can do it, and then, if he has a corresponding permit! If you break any road traffic regulation, you can be quit for a standard fine. However, you can also be deprived of a driving license. Everything exceptionally depends on what decision the policeman will take. Do not even think to offer a bribe to the policeman. In Dubai, you can be brought to trial for such actions. The ‘left-of-way’ rule is in force in Dubai. By and large, drivers in UAE are extremely disciplined. That is why there is an order on roads. The heaviest traffic is on Friday. Therefore, if you go somewhere on this day, be especially careful and attentive. Petrol 95 costs 0.65 Euro. Petrol 98 costs 0.73 Euro. The quality of petrol leaves no doubt whatsoever, especially in comparison with Russia and a row of other European countries. The principle of work performance of all petrol retail stations is similar. You do not even need to leave a car. Refueling operators will fill up your car on their own. They will also clean the wind and rear screens if necessary. The operators do all this work absolutely for free, but they will be extremely thankful if you give them a tip. You can pay for fuel both in cash and by credit card. There is one more important thing you need to remember when going to a petrol station in Dubai. In the United Arabian Emirates, it is accepted to measure fuel not in liters but in gallons. One gallon is equal to 4 liters of fuel. If you forget about it, you risk being in a false position. If you have already got acquainted with all sights of Dubai and decided to go on an excursion to the neighboring Abu-Dabi, you will have to use a toll road. The two famous toll roads in UAE are Sheikh Zayed Road and Al Garhoud Bridge. The cost of a single passage is around 1 Euro for cars hired in Dubai. There are sufficiently enough toll roads on the territory of the United Arabian Emirates. However, it will be fair to point out that free roads in UAE are perfect as well! UAE from 17 eur a day. We've got tired of traveling on arranged tours. All of them are a bit primitive. Recently we've decided to visit Greece by car. Impressions are quite different and you can see as much as possible, but the level of spending is much lower. We've rent a car via this site. We've found everything there, chose a car and paid for it. Everything is very simple, understandable and convenient. I recommend it to everybody.